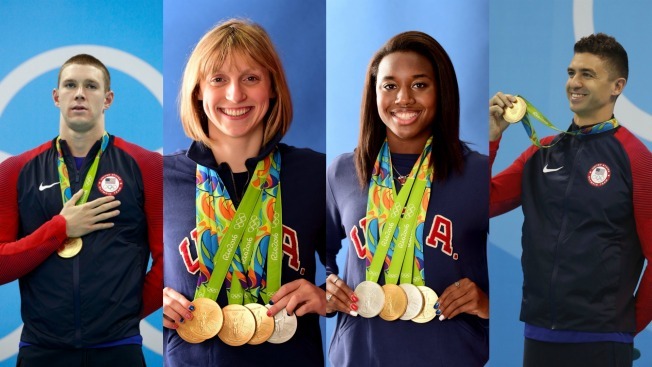 Ryan Murphy, Katie Ledecky, Simone Manuel and Anthony Ervin (left to right) were just some of the Olympians affiliated with the Pac-12 Conference to take home Rio 2016 medals. Team USA racked up a 121 medals at the Rio Games thanks to the athletic prowess of athletes stationed right here in the Bay Area and along the West Coast. A total of 55 medals were won by Olympians affiliated with the Pac-12 Conference across 12 different sports, highlighted by Stanford University and the University of California at Berkeley. Cardinal Olympians led the way, taking home 27 medals while Golden Bear stars tallied 21, placing in a tie for second among Pac-12 schools, according to the Pac-12 website. From first-timers to established Olympic veterans, athletes with ties to the Bay Area stole the stage on several fields of play. Stanford-bound swimmer Katie Ledecky captured four gold medals and shattered her own world records in the 400 and 800-meter freestyle races while her future Cardinal teammate Simone Manuel broke ground and became the first African-American woman to fashion an individual gold for the United States swimming team, according to the Pac-12 website. Stanford's bragging rights gained even more clout when the United States women's water polo team, which includes five Olympians with ties to Stanford, defended its gold medal title. Not to be outdone, Cal swimmers Ryan Murphy, Anthony Ervin and Nathan Adrian all took home multiple pieces of gold medal hardware. If the Pac-12 Conference, which was represented by 246 athletes competing in 23 different sports, was its own country, it would have placed fifth in the Rio 2016 medal count, according to the Pac-12.